Sevilla Futbol City Guide | Tiki-Taka-Gol! Sevilla (Seville if you insist) is the capital of Andalucia and the largest city in Southern Spain with a population of around 700,000. 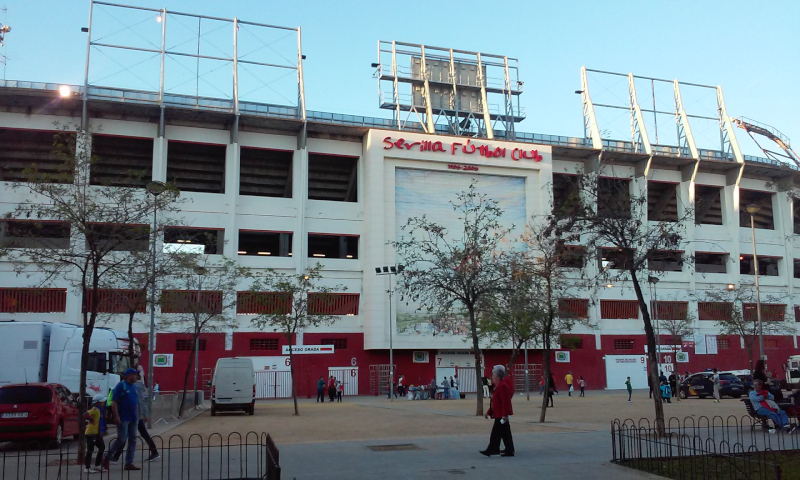 Passion for football runs deep here and it is home to two of Spanish football’s oldest clubs, both of whom are currently in the Primera Division and regularly attract crowds in excess of 30,000. With top flight action every weekend, two of the noisiest stadiums in the land and plenty to see and do away from the pitch, it’s a wonderful place for football fans to visit. 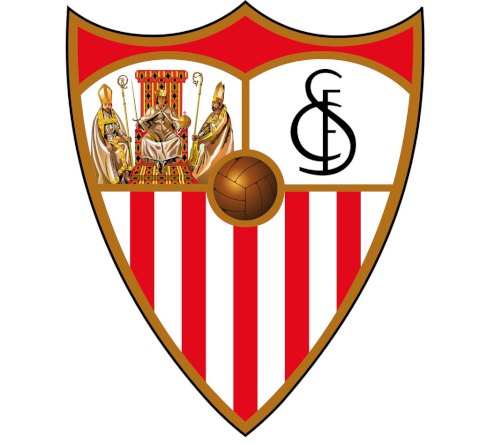 Founded by a Scotsman in 1890, like a fine wine, Sevilla FC has got better with age and the club has already won more major trophies in the 21st Century than they managed in all of the 20th. Although they’ve only once won La Liga, since the turn of the millenia Sevilla have become real cup kings bagging two Copa del Rey trophies and an incredible 4 Europa Leagues in the space of 9 years making them the most successful side in the competition’s history. The 2015-16 campaign sees them back in the Champions League on the back of their latest continental triumph in Warsaw against Dnipro in May. There is a special buzz about European nights at the Estadio Ramón Sánchez-Pizjuán and it has become a real fortress in recent times. With Unai Emery currently overseeing a golden era in the club’s history this is certainly a good time to take in a Sevilla game and they frequently humble the giants on home soil, where they were only beaten once last season. While Sevilla FC, very broadly speaking at least has more of a middle class following, Real Betis are very much the working class club, based in the Heliopolis neighbourhood which is close to some of the most deprived districts in the city and indeed all of of Spain. Comparisons could certainly be drawn with the likes of Everton or pre-Arab Manchester City in that despite struggles on the pitch they lay claim to being ‘the peoples club’. Indeed in the 2014-15 season their average attendance was almost identical to that of their city rivals despite Betis playing down in the 2nd tier. 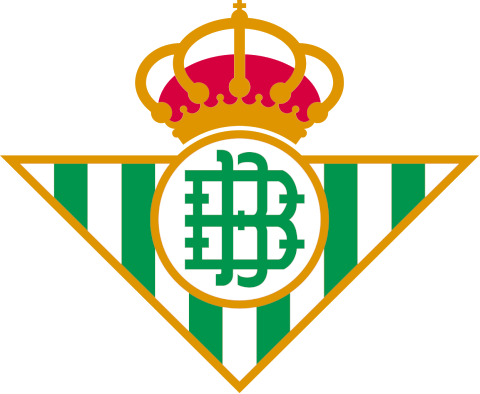 Success on the pitch has been something of a rarity for Real Betis though and although they are rarely away for long, they have been relegated from the Primera Division, an astonishing 11 times in their history. Their most recent major success came in 2005 when they beat Osasuna to win the Copa del Rey. Getting There – Take the metro to Nervion Station which is only a 2 minute walk from the stadium. It is 2km East of the city centre and plenty of buses head that way while a taxi should be 5-10 Euros depending on where you’re coming from. Getting There – Not close to the metro line so taking a bus or a taxi is your best option and it is only 3km South of the Old Town so neither will be expensive. Prado de San Sebastian is probably the best place to take a bus from and Estadio Benito Villamarín is served by lines 1, 2, 6, 34 and 37 with single tickets costing €1.40. Tenants – No Regular tenants. 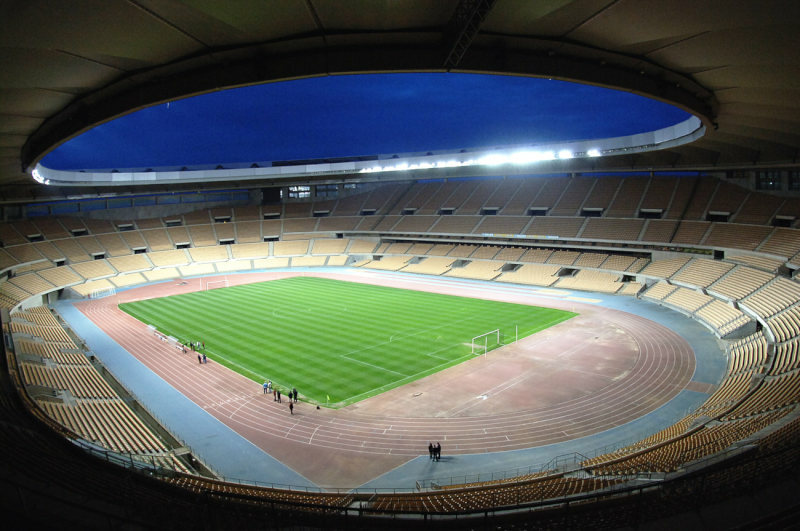 The little used Estadio de la Cartuja (aka Estadio Olímpico de Sevilla) is the biggest stadium in the city and was originally built for the 1999 World Athletics Championships during Spain’s construction boom. It also hosted the 2003 UEFA Cup final as Jose Mourinho’s Porto beat Celtic but apart from hosting a few concerts and the occasional sporting event it has become something of a white elephant. Even when the Spanish national team play in the city they tend to opt for the smaller and more centrally located Estadio Ramón Sánchez-Pizjuán. Getting There – Located on the other side of the river, it’s not the easiest place to get to from the city centre. Bus lines C1 and C2 head that way but if you are travelling as a group it’s more convenient and won’t work out much more expensive to get a taxi. Tickets for both clubs can be ordered online or at the respective stadiums. Tickets only go on sale about 3 weeks before the match, when the exact time has been confirmed so it is impossible to purchase them a long way in advance. That said it is very rare that either club sells out completely as the stadiums are so large. The cheaper tickets do sell out quickly though for the big games, especially the visits of Barcelona and Real Madrid so if you’re looking to attend those game, it’s best to regularly check the links below as you wait for tickets to go on sale. Tickets at Sevilla FC usually start at 25 Euros for La Liga matches, with discounts available for most Copa del Rey games. Prices tend to more than double for the games against Barca or Real Madrid though so count on paying at least 60 Euros for those matches for even the cheapest tickets. 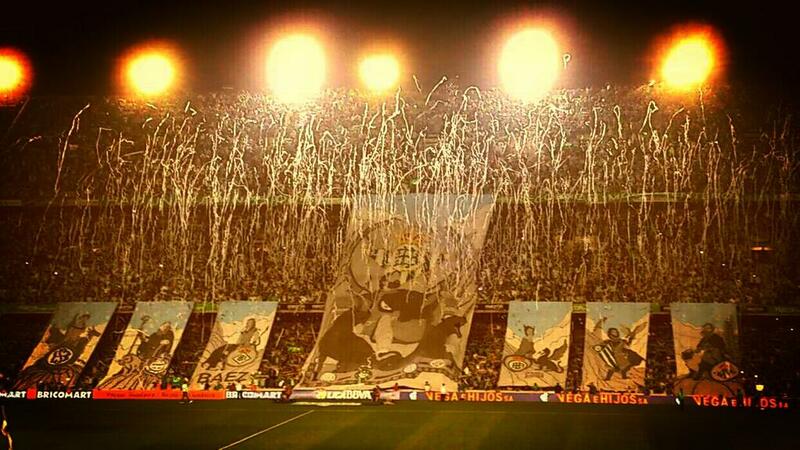 Prices at Real Betis are slightly higher with tickets starting at 30 Euros for most matches. Given that the Estadio Benito Villamarín holds over 50,000 you generally have more choice of where to sit with average crowds around 30,000-35,000. Note tickets in the third tier are very high up! The atmosphere at football matches in the city rivals anything there is in Spain. Fans usually gather around in local bars, of which there are plenty, for a few drinks and some food an hour or so before kick-off before heading into the ground (as with other stadiums in Spain, only alcohol-free beer is served inside). Both clubs receive tremendous backing and decibel levels are certainly a few notches up on anything you get at the Camp Nou or Bernabeu for typical league games. Sevilla have their Biris Norte Ultras who are a lively bunch based behind the Northern goal and they also boast a belting club anthem that is sang on all four corners of the ground prior to every game. Betis have their infamous Supporters Gol Sur, which are in the small single tiered Southern stand and they create one hell of a racket but are prone to causing a bit of trouble and are known for their far right ideology. It’s not just a small bunch of ultras making all the noise though as in this city, fans in every stand get involved with the chanting, scarf holding and flag waving, all of which are big parts of the Sevillan football experience. One factor to bear in mind here is the heat which can make this city quite unbearable during the summer months when temperatures regularly exceed 40 degrees Celsius. Kick-off times in August and September are usually always late at night (after 9:00pm) with games in the past kicking off as late as 11:00pm and finishing close to 1:00am to make things more tolerable. During the rest of the season kick off times vary due to the staggered nature of the La Liga weekend but games in the city are often chosen for the early Noon kick-offs or evening slots as temperatures remain warm throughout the year. European games kick off at 8:45pm (Champions League) or 9:05pm (Europa League) local time. 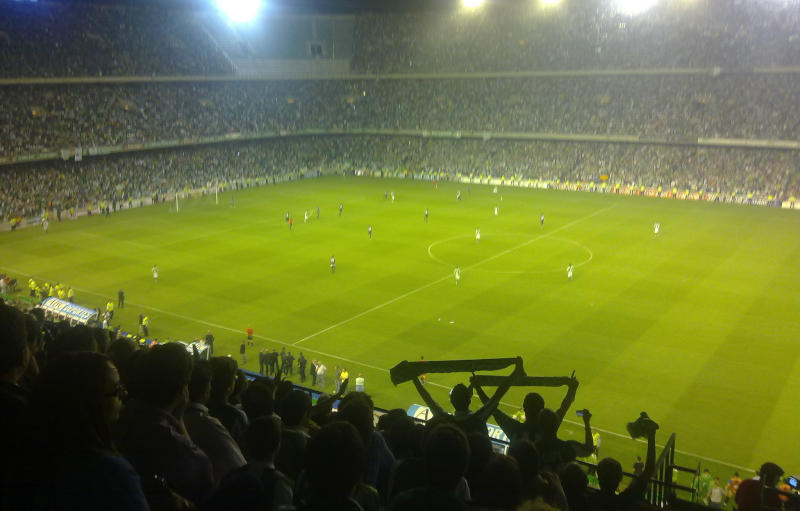 The Seville derby is widely regarded as the most passionate city derby in all of Spain. Unlike in the other big towns, roughly half of Sevillanos support Betis and the other half Sevilla FC and although the latter are traditionally the more successful there isn’t a huge gulf in size or class which can take the edge off the local rivalries in places like Barcelona and Valencia. In terms of its ferocity only El Clasico can really compete and El Derbi Sevillano is a fiercely fought contest on the pitch and sometimes off it. With Real Betis back in La Liga for the 2015/16 season after a year in the Segunda Division the meetings this season are guaranteed to be passionate affairs. Muchos policias for this one as well between Sevilla and Malaga, the clubs that carry the name of the two biggest cities in the large sun-soaked region of Andalucia. With 200km between the cities, they aren’t exactly next door neighbours but in La Liga terms it is a derby and traditionally the two sides battle it out to be the pride of the region with Sevilla currently holding the upper hand. Seville Airport isn’t huge but it does have international routes to a number of European cities including London (Stansted). It is located on the edge of the city and there are regular airport express buses than run into the centre, taking around 20-30 minutes costing 4 Euros, while you can expect to pay around 30 Euros for a cab. If you’re on a tight budget or there are no flights to Seville from your local airport then consider flying to Malaga or even Faro, Portugal which are both served by a huge amount of budget airline flights. From either it will take 2-3 hours to get to Seville by bus or train and cost in the region of 15-25 Euros unless you opt for one of the high-speed trains from Malaga. Santa Justa is the main railway station in town and has high speed links to Madrid ( hours) and is well connected to the rest of Andalucia with regular services to Cadiz, Cordoba, Jaen and Malaga. Check Renfe for train schedules, prices and to book tickets. 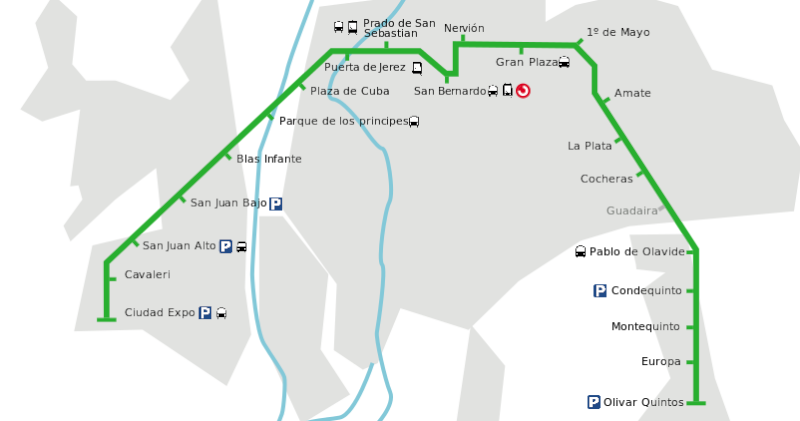 The Seville Metro currently has only one line so depending on where you’re staying it might not be much use to you. If you’re close to it then it can be pretty useful to get around and it might be worth taking out a 10 trip pass although single tickets are also fairly cheap at less than 2 Euros. The Sevilla stadium is just 2 minutes walk from Nervion station while for the Betis ground it is best to get off at Prado San Sebastian and take a bus (34 or 37). Puerta de Jerez is your best bet if you’re looking at heading into the main shopping streets and Old Town. In the absence of a large suburban rail network, buses are the most popular form of public transport with the widest coverage. Bus stops are everywhere and single trips cost €1.40 which you pay the driver when you get on. Information is rarely in English though and don’t expect many people to speak it in Sevilla beyond the more touristy spots. Within the city centre buses aren’t that much use though as most of the streets are too narrow for them so they are of more use to locals trying to get into the suburbs than visitors. City Sightseeing run fairly expensive but regular Hop On Hop Off buses that take you around the main sights of the city which you can explore at your own leisure. It’s a decent option if you only have limited time to see the city but if you have a few days, you can see most of the sites on foot. For 18 Euros you can get a 24 hour pass, while 21 Euros gets you a 48 hour one. 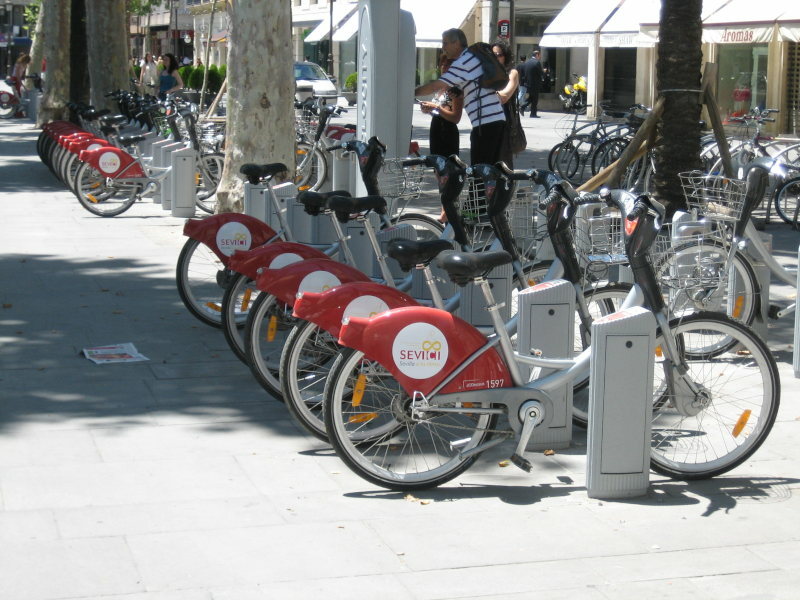 The best way to get around the city is by bike and many locals and visitors get around using the excellent Sevici Bikes scheme. It is a good way to see the city and get from A to B given Sevilla is very flat and bike lanes and stations are everywhere. The only package available to short-term visitors costs 13.33 Euros for a week of travel (small extra charges apply if you spend more than 30 minutes on a bike at one time but most journeys will take less and you can simply dock the bike and immediately take another one out to avoid charges). You do though need to pay a 150 Euros deposit, which obviously is refunded unless you lose a bike, which is pretty hard to do, but be careful when docking them to make sure it is locked in place (listen for the double beep!). More info on the Short Term Subscription here. There are hundreds of places to dock your bikes scattered all around the city although be warned that some stations can fill up especially in the city centre early in the evening and it’s probably best not to cycle all the way to a stadium on matchday unless you do it early. Instead dock your bike at a station a few hundred metres or so away and walk the rest as people tend to spill over into the bike lanes when it gets busy. Taxis are all metered and aren’t too expensive although there are lots of one-way streets in the city centre and sometimes taxis can take you the long way around to raise the cost of the ride. They can be useful when you get lost though as the old town is an incredibly confusing place to get your head around for newcomers. Most taxi drivers do not speak English. The tram is fairly useless unless you aren’t capable of walking as it only covers a few kilometres and was for some reason mostly built on top of the already existing metro line with a small extension to Plaza Neuva. It is possible to cycle from one end of the tram line to the other faster than the time it takes the tram to do likewise and you can walk it in about 20-30 minutes. Sevilla is quite a big city with a large central area on one side of the River. If you find some accommodation in the city centre and don’t mind doing quite a bit of walking it is possible to see most of it on foot but there are lots of narrow winding streets and it’s very easy to get lost so take a good map or better still use make use of your mobile’s GPS. The Sevilla FC stadium is just about walkable from the city centre although you’ll probably need some form of transport to get to Betis. If you are in the city between April and October chances are it will be very hot so spending all day walking around in the sun isn’t always too pleasant and taking a siesta during the heat of the afternoon is no bad idea! Take a Stroll around the relaxing Parque Maria Luisa. Day Trip – The ancient city of Cadiz, home to one of Spain’s best beaches is under 2 hours away, while Cordoba is even closer and is another interesting historic city. Plaza de España, Spain’s most impressive square is a true masterpiece and a must-visit no matter how short your time in Seville is. Take in some Flamenco or Sevillano music and dancing with shows on somewhere in town, 365 days a year. Visit the Real Alcázar, a lavish Moorish palace in the heart of the city. Locals love a good fiesta and there are an enormous selection of bars and clubs around town. Most are quite small local affairs with Cruzcampo the beer on tap and usually very cheap. Nightlife hubs include Plaza Alfalfa, home to plenty of student bars and is probably the liveliest part of town on a weeknight. On Friday and Saturday nights the enormous Plaza Alameda is teeming with life until sunrise and has a bit of a rebellious vibe with large groups of friends hanging out drinking in the square Botellón style, while numerous bars and clubs can be found on both sides on it. Triana (on the other side of the river) is another cool neighbourhood to hang out in with a slightly more relaxed atmosphere, while in the summer months plenty of open-air clubs open the doors and generally don’t close till 6:00am. If you want to catch some football from England or other European countries, then the Irish pubs are your best bet and Phoenix Pub in Triana is the cheapest option and arguably the best.